Welcome back for this month’s Submission Roundup! There are so many awesome calls in the coming weeks, so hopefully if you have a story or poem looking for a home, one of these markets might be a good place to send it! First, the usual disclaimer: I am not a representative for any of these publications. If you have any questions, please direct them to the respective editors. What They Want: Character-driven and beautifully written grotesque stories about the monsters in women’s lives. Open to all female-identifying writers. What They Want: Open to quiet literary horror stories. What They Want: Open to flash fiction of a variety of genres. What They Want: Open to queer werewolf stories of all genres (horror, sci-fi, fantasy, etc.). The editors are also accepting comic pitches. What They Want: Editors doungjai gam and Ed Kurtz are seeking stories that blend horror and crime fiction. This entry was posted in Fiction, Submission Roundup on November 8, 2018 by gwendolynkiste. Welcome back for this month’s Submission Roundup! There’s a great group of submission calls below, so if you’ve got a story looking for a home (or you’re eager to write a new one just for the occasion), then these publications might just be the perfect fit! As always, a quick reminder: I am not a representative for any of these markets, so please direct your questions to the respective editors. What They Want: Flame Tree’s latest anthologies are now open to submission. In particular, the American Gothic call looks perfect for the horror fiction writers out there. What They Want: Open to holiday-themed science fiction. What They Want: The editors are seeking stories of Asian main characters in an alternate past, present, or future. Open to authors with a geographical Asian heritage. What They Want: Open to speculative fiction from New Zealand and Australian authors. What They Want: Open to first-person horror stories. This entry was posted in Fiction, Submission Roundup on October 8, 2018 by gwendolynkiste. Welcome back for this month’s Submission Roundup! Plenty of fabulous opportunities to send your fiction and poetry out into the world, but first, the usual disclaimer: I’m not a representative for any of these publications. If you’ve got any questions, please direct them to the respective editors! And now with that out of the way, onward with this month’s Submission Roundup! What They Want: Open to poetry on the theme of witches. What They Want: Open to a wide range of horror short stories. What They Want: The editors are seeking original speculative fiction about revolution and resistance. What They Want: Open to character-driven horror, dark fantasy, weird western, and science fiction. What They Want: An anthology of fairy tales that have a dieselpunk and decopunk twist. What They Want: Open to horror fiction written by authors who identify to any degree as women. Original fiction preferred over reprints. What They Want: Open to speculative fiction and nonfiction essays about people of marginalized genders/sexes who are scientists. What They Want: Twelfth Planet Press is seeking novellas in the science fiction, fantasy, horror, and crime genres. This entry was posted in Fiction, Submission Roundup on September 4, 2018 by gwendolynkiste. Welcome back for this month’s Submission Roundup! First off, yes, the month is indeed almost over, but July’s post is here, in just under the wire! Some of these deadlines are coming up quickly, while others are still a couple months away, so please check the guidelines, and plan accordingly. A perennial reminder: I am not a representative for any of these publications, so if you’ve got questions about anything, please direct them to the respective editors. 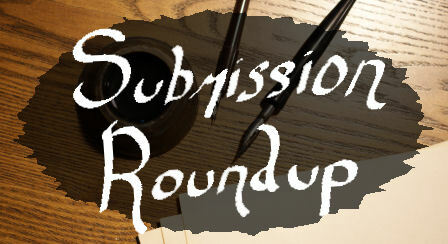 With that out of the way, onward with this month’s Submission Roundup! What They Want: Open to horror stories about dark, abandoned places and what lurks within. What They Want: Open to speculative fiction novellas. What They Want: Open to futuristic speculative fiction that incorporates aspects of punk music. What They Want: The editors are seeking festive-themed novellas with a positive, joyful spin. Open to speculative fiction as well as romance, contemporary fiction, and crime. What They Want: Open to horror fiction about serial killers. This entry was posted in Fiction, Submission Roundup on July 30, 2018 by gwendolynkiste.